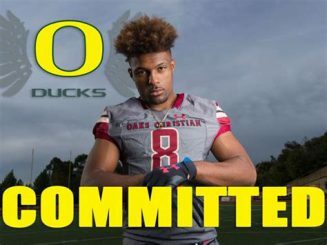 Kayvon Thibodeaux: What’s His Ceiling? 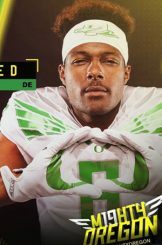 The Oregon Ducks signed one of the top high school football players at any position during the December 2018 early signing period. 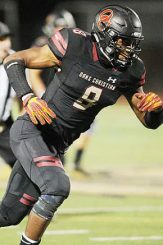 That would be Kayvon Thibodeaux, a defensive end from Oaks Christian High School in Westlake Village, California. Thibodeaux was named the All-USA Defensive Player-of-the-Year in December, led his “Ballaholics” team to the American Family Insurance Skills Challenge Title, and then played in the Under Armour All-American game on January 3, 2019. Thibodeaux has rare length and strength, coupled with elite athleticism. At The Opening – Regionals in Los Angeles in March 2018, he was measured at a shade under 6-foot-5 and weighed 234 pounds. At the Opening – Finals later in the spring, he recorded 4.67 40-clock and an absurd 4.21 20-yard short shuttle. I thought that it would be interesting to see how he “stacks” up against some of the top 9-Technique “Edge Guys” in the last 20 years. I doubt that I can add much to what has already been said about the talent of Thibodeaux. What I can do, however, is add perspective or context so we have a feel for not only where he is presently in his development, but where his career trajectory or “ceiling” may be. I took a look at 74 athletes over the last 20 years (2000-2019) before settling on 18 that I ranked. But before we list the results, let’s review the criteria that defines the rankings. Body Type – I looked for athletes who were 6-foot-3 to 6-foot-6 tall and weighed in the range of 220 pounds to 240 pounds. I looked for guys who were defined as “Weak Side Defensive Ends” in high school. They are prototypical 9-Technique (3-4 OLB or 4-3 DE) in Pro terminology. No Strong Side Defensive Ends were considered. This is a size-driven criterion. If the athlete under consideration is over 250 pounds in high school (and still growing), it’s a safe assumption that he is not an Edge guy. The reason being is if we subjectively add 20 pounds to their reported high school weight, it will be a safe assumption that they will be well over the prototypical weight of an Edge Guy prior to the NFL Draft Combine in three or four years. I focused on athletes that were highly regarded coming out of high school, and were (are) “stars” in college. They tested well at the NFL Combine, and had/have stellar NFL careers. No “late bloomers” were considered. How Does the Score Work? The score is a metric used widely across all athletics to measure an athlete’s aptitude for a given sport. In it’s basic form, it measures: Height, Weight, Speed, Power, Agility, Reaction, and Quickness in a variety of events such as the 40 yard dash, the 20 yard Short Shuttle, etc. Nike developed an algorithm (SPARQ) which is an acronym for the testing listed above. It was out in the public domain until they rescinded it without explanation in 2013. Davis Hsu of Fieldgulls wrote an article where the hyperlink to the calculator was published. It was subsequently replaced by Nike apparel for sale. Another blogger, Zach Whitman from Three Sigma Athlete, replicated a version of the Nike calculator in 2013. He was roundly criticized by Josh Hermanson in anther article ostensibly because Whitman held the formulas in confidence, rather than put it out into the public domain. Hermanson then published coefficients of Whitman’s calculator that are not exact, but close and called his work SPORK scores. One has to appreciate Hermanson’s snarky sense of humor. The components of this computer algorithm are all slightly different given the priorities of different positions in different sports. For example, the speed and quickness of a Shortstop in baseball, would not be as desirable as size and strength for 0-Technique Nose Tackle in football. A sampling of NFL teams using metrics beside the Seattle Seahawks are the San Francisco 49ers, and the Green Bay Packers. We can assume every other team in the NFL does as well. Some of the scores listed below come directly from The Opening – Regionals (or Finals) by Nike and are (Confirmed). Some come from an athlete’s testing done at the NFL Draft Combine held every year in Indianapolis (Confirmed-NFL Combine). The last group is scored by (Algorithm) where there is one or more testing results that is missing. I have arbitrarily entered a value based upon similar data available for similar athletes to complete the calculation. 18. Myles Garrett – High School Class – 2014 – #1 WDE (Texas A&M) – ESPN Rating of 95 – Drafted Round 1 (#1) 2017 – SCORE 85.68 (Confirmed). 17. Carl Lawson – High School Class 2013 – #1 WDE (Auburn) – ESPN Rating of 92 (Not Tested). Drafted Round 4 (#116) 2017 – SCORE 91.11 (Algorithm). 16. Derrick Harvey – High School Class 2004 – #3 WDE (Florida) – Drafted Round 1 (#8) 2008 – SCORE 103.63 (Algorithm). 15. K.J. Henry – High School Class 2018 – #3 WDE – ESPN Rating of 92 – Clemson Signee – SCORE 107.03 (Confirmed). 14. Micah Parsons – High School Class 2018 – #2 WDE – ESPN Rating of 91 – Penn State Signee – SCORE 110.08 (Confirmed). 13. Jaelan Phillips – High School Class 2017 – #1 WDE – ESPN Rating of 93 – UCLA Signee – SCORE 111.17 (Confirmed). 12. Jarvis Moss – High School Class 2003 – #1 WDE – (Florida) – Drafted Round 1 (#17) 2007 – SCORE 113.24 (Algorithm). 11. 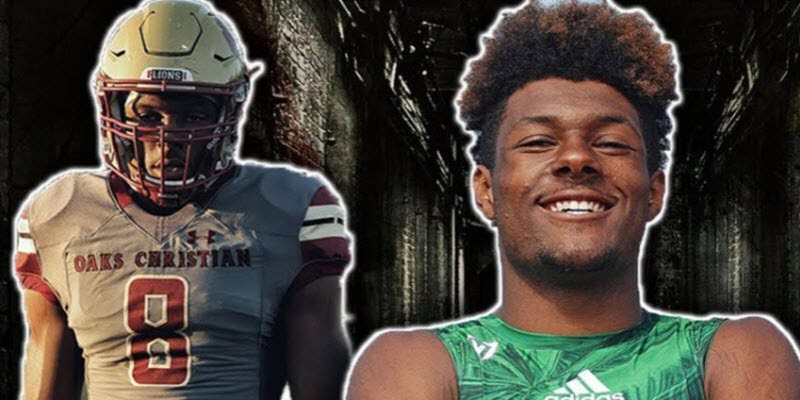 Kayvon Thibodeaux – High School Class 2019 – #2 WDE – ESPN Rating of 92 – Oregon Signee – SCORE 115.52 (Algorithm). 10. Terrell Suggs – High School Class 2000 – #1 WDE (Arizona State) – Drafted Round 1 (#10) 2003 – SCORE 123.77 (Algorithm). 9. Shawne Merriman – High School Class 2002 – #14 WDE (Maryland) – Drafted Round 1 (#12) 2005 – SCORE 124.63 (Algorithm). 8. Kamerion Wimbley – High School Class 2002 – #6 WDE (Florida State) – Drafted Round 1 (#13) 2006 – SCORE 126.27 (Confirmed-NFL Combine). 7. Brian Orakpo – High School Class 2004 – #14 WDE (Texas) – Drafted Round 1 (#13) 2009 – SCORE 126.81 (Confirmed-NFL Combine). 6. Aaron Maybin – High School Class 2006 – #6 WDE (Penn State) – Drafted Round 1 (#11) 2009 – SCORE 127.09 (Confirmed-NFL Combine). 5. Lorenzo Carter – High School Class 2014 – #2 WDE (Georgia) – Drafted Round 3 (#2) 2018 – SCORE 129.76 (Confirmed). 4. Vernon Gholston – High School Class 2004 – #10 WDE (Ohio State) – ESPN Rating of 90 – Drafted Round 1 (#6) 2008 – SCORE 130.62 (Confirmed-NFL Combine). 3. Jadaveon Clowney – High School Class 2011 – #1 WDE (South Carolina) – ESPN Rating of 95 (Not Tested) – Drafted Round 1 (#1) 2014 – SCORE 131.67 (Confirmed-NFL Combine). 2. Nolan Smith – High School Class 2019 – #1 WDE (Georgia) – ESPN Rating of 92 – SCORE 141.18 (Confirmed). 1. Josh Sweat – High School Class 2015 – #1 WDE (Florida State) – ESPN Rating of 90 – SCORE 148.28 (Confirmed). Here are a few that I did not include due to a lack of information: CeCe Jefferson (Florida) scored a 90, Eyabi Anoma (Alabama)-94, Erasmus James (Wisconsin), DeMarcus Ware (Troy), Robert Beal (Georgia)-90. None of these athletes had testing done at a sanctioned event in high school where they could be accurately evaluated for inclusion in the rankings above. Here are a few notables that did not score high enough coming out of high school, though they were close: Ronald Powell (USC) – scored an 89, Noah Spence (Ohio State) – 86, Devon Kennard (USC) – 86, Martez Wilson (Illinois) – 87, Keisean Lucier-South (UCLA) – 89 and Anthony Chickillo (Miami) – 83. Here is a list of guys I considered Strong Side Defensive Ends (SDE) due to their size coming out of high school: Zach Harrison (Ohio State) Scored a 90, Joshua Kaindoh (Florida State) – 90, Nick Bosa (Ohio State) – 93, Byron Cowart (Auburn) – 93, Canton Kaumatule (Oregon) – 90, Da’Shawn Hand (Alabama) – 94, Robert Nkemdiche (Ole Miss) – 94, Mario Edwards (Florida State) – 90 and Da’Quan Bowers (Clemson) – 95. There are a whole host of athletes who were “late bloomers.” By that I mean they were unremarkable in high school, but had meteoric improvement in college and became high NFL draft choices. They went on to become stars in the National Football League. To name a few: Barkevious Mingo, Corey Lemonier, Nick Perry, Olivier Vernon, Robert Quinn, Ryan Kerrigan, Cameron Jordan, J.J. Watt, Everson Griffin, Carlos Dunlap, Jason Pierre-Paul, Greg Hardy, Connor Barwin, Cliff Avril, Phillip Merling, Chris Long, Lawrence Jackson, Manny Lawson, Mathias Kiwanuka, Elvis Dumervil, Tamba Hali, Ray Edwards, Frostee Rucker, Justin Tuck and Chris Canty. The ratings listed above are not a perfect science. The reason being is that the athletes that have been tested and have a confirmed score from the NFL Scouting Combine are three-to-four years older than athletes that have a confirmed score from a high school testing camp, such as Nike’s The Opening-Regionals or Adidas 3-Stripe camps. This age difference is significant, and it can have a dramatic effect on an athlete’s score. Even small improvements across the board could potentially add 15 points to Thibodeaux’s score and elevate his ceiling from No. 11 (currently) and into the Top-5 Edge Rushers of the last 20 years. It’s safe to say that Thibodeaux is going to be a nightmare for opposing teams for the next three or four years.